Ever go through your closet and keep things because you like them, knowing full well you will never wear them again? Such was the case with a ruffled white tank top in my closet, and after a couple years of saving it for no reason I decided that if I liked it so much, why not make it into something I would really use and enjoy on a daily basis. 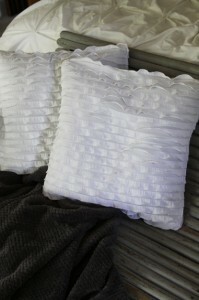 Out came a matching pair of white ruffled pillows. So as I mentioned I had this ruffled white tank top that I bought a few years back to wear under a suit coat for a formal occasion. 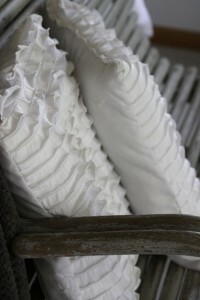 It was made of a pretty white ruffled fabric and contained ruffles on the front and the back too. It worked perfectly underneath a coat, but to wear it alone seemed a bit silly – I felt like a festive pinata or something just covered in ruffles all the way around. I kept it, in hopes that I would find another reason to wear it, but nothing arose that fit the “pinata tank top”. I had it in a pile to donate to Goodwill when it hit me. I have pinned several beautiful white ruffled pillows on Pinterest and the tank top had the perfect fabric to recreate the ones I had been admiring. I found a pillow that I had laying around and stuffed it inside the stretchy tank top – it was the perfect size! I have been wanting to get a pair of pillows in white ruffles for months, but every time I see them I am baffled by the high price. Here was my solution. Instead of giving away my pinata tank I would transform it into the pillows I had been wanting, but couldn’t afford. So, I got out some scissors and cut the straps of of the tank. I then opened the seams at the side of the shirt and was left with two pieces of ruffled fabric that were just the right size for the pillows that I already had. Because I wanted two pillows I decided that just the fronts of them would be ruffled and the backs would be a nice smooth fabric sothey were still comfortable to use and not just purely decorative. I found an old spare white sheet and cut two squares in the same size as the ruffled fabric. 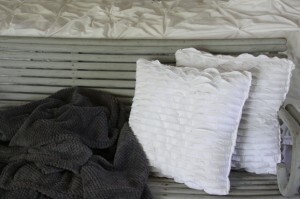 I then sewed the four pieces of fabric into two perfect pillows for our home. They turned out really great and in the end it really made me happy to create something I had been wanting out of things that I already had or was going to get rid of! I think the tank top came from a Kohls clearance rack but I now see that they sell ruffled fabric in any fabric or craft store. That also would be a fabulous and inexpensive way to make your own ruffled pillows if you don’t have a pinata tank in your closet. I have used the ruffled fabric for several projects like: ruffled boot socks, ruffled purses , and dresses for my daughter. I guess the moral of the story is – rethink that stuff in the pile that you are going to give away. Is there something that you could use it for with a little modification. Pillows or mittens made from sweaters are cozy and wonderful, and button up shirts make a great backing for a removable pillow cover. Turn you favorite old tank tops into dress or fun pillows for your kids. Think outside the box and you might like what you come up with! What is your favorite re purpose from a piece of clothing that you have tried?